Special Features:-Perfect Fit:Seamless match your Fitbit Versa Smart Watch. 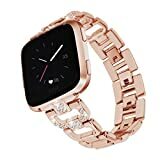 -Premium Material:Premium stainless steel metal with Rhinestones makes your Fitbit Versa Smart Watch like a Jewelry. -Easy Replacement:Unique design of the clasp makes you easy to change the strap and never fall off!. -Fitbit Versa Smart Watch Device are not included. -Each band come with 3 pins. – You have the right for hassle free replacement or money back during the warranty. – We take care of all quality-related issues with a replacement or refund. Please contact us. – Way one: On this page, click on “Fundro” next to “Sold by”, then click on “Ask a question” on the right top of page. – Search “Fundro Band” for more bands and accessories offered by Fundro Online store. ▶Chic Design: Set with Sparkling rhinestones on the band, just looks like bling stars on your wrist, bring you tons of compliments on how nice it looks. ▶Perfect Wearing Experience: High quality metal material for added comfort and durability, Perfect for work and dressy occasions. ▶Easy to Take On and Off: Fit for 5.31 – 8.1 inches wrists, Simply remove the folding clasp with your hand. No tool is needed. ▶Multiple Color to Choose: Multiple color for you to personalize your watch with this stylish metal strap that is a fashionable and comfortable choice for you . ▶Warranty: For 18 months after the date of purchase, we take care of all quality-related issues with a REPLACEMENT or REFUND. Any problems, please kindly message us.